The only kind of rice I’m craving to eat with barbecued pork or chicken is the java rice. It can also be great with other grilled stuffs like grilled fish or seafoods. 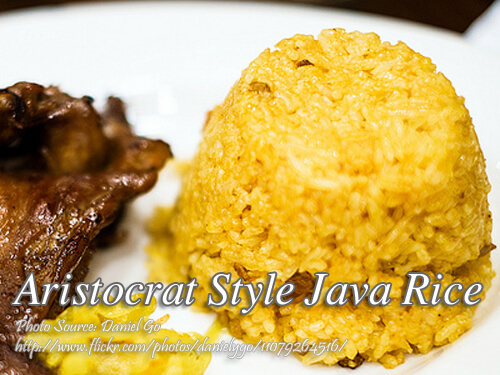 But what I miss the most is the Aristocrat style java rice which I think I haven’t tasted in most food courts or fast food restaurants offering Filipino dishes and sizzling plate dishes. I think what they are missing in their java rice is the soy sauce and tomato catsup which I’ve learned from a friend many years ago. So if you are grilling some meat or fish specially if you are planning a get away on a beach or a swimming resort on this summer, then this java rice is a perfect combination. The only kind of rice I'm craving to eat with barbecued pork or chicken is the java rice. It can also be great with other grilled stuffs like grilled fish or seafoods. Heat oil in a wok and add annatto powder. In case you are using annato seeds, heat the oil gently while stirring the seeds until the oil becomes orange. After 4 minutes, discard the seeds. Adjust the heat to medium and add in the garlic and saute until slightly brown. Add in the butter and cooked rice and stir fry for a few minutes until all the grains are coated with the annato oil and the rice becomes yellow in color. Stir fry with a mixing motion until all the rice lumps are gone and the color is even. In the meantime mix the tomato catsup and soy sauce in a small cup before pouring it over the rice. Depending on your taste, you can add more soy sauce and tomato sauce. Pour soy sauce catsup mixture over the rice and continue to stir fry until the mixture coats all the rice grains and the color is evenly distributed. Adjust the heat to high if necessary. Season with salt and pepper while stir frying the rice. You can also garnish it with fried garlic. Serve hot with barbecued pork or chicken or grilled fish or seafood. May I ask what kind of catsup you use? Filipino style or the Western style? Thank you! Hi Lea, I use the original blend Del Monte tomato catsup. I’m not sure if it will taste the same using other brands but I think as long as it is tomato catsup you can use any. Hi, in your recipe it says tomato catsup, but your comment above says you use banana catsup. Which of the two tastes better in this recipe ala Aristocrat? Hi Mel, Sorry for the typo I’ve mistakenly written the banana catsup in my comment. My apologies. Hello! What brand of soy sauce do you use? Thank you! Hi Jerico, you can use any local brand of soy sauce.